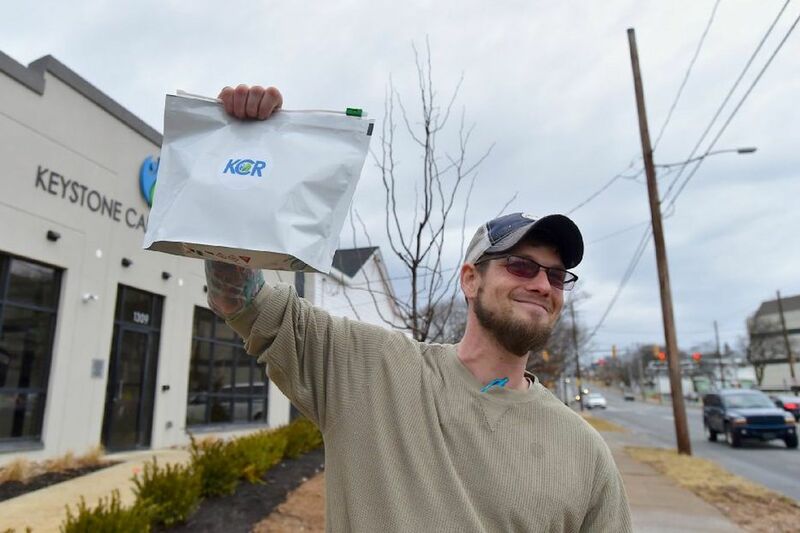 Josh Lazarus, of York, bought $550 worth of medical marijuana products on the first day of business at Keystone Canna Remedies in Bethlehem Pa..
Too much demand. Not enough supply. Less than two weeks after it was launched, Pennsylvania's medical marijuana program is a victim of its own success. The two open marijuana dispensaries in the Philadelphia region reported Friday that they had sold out of most medicines and might not be restocked until after March 15. "We have no inventory," said Chris Visco, co-owner of the TerraVida Holistic Center in Sellersville, Bucks County. "We took a shipment on Wednesday. On Thursday, we had the biggest sales day we've ever had. By this morning, all we had left were a handful of disposable vape pens," a type of electronic cigarette loaded with hash oil. Supplies were so limited at the Keystone Shop in Devon that the owners decided on Thursday to shutter it. A notice on the dispensary's website said it would remain closed until further notice. "We're looking at resuming sales the third week in March," said Skip Shuda, Keystone Shop's chief operating officer. "It's frustrating for us, and it's frustrating for a lot of patients who were looking for medicine." Several factors caused the drought. Chiefly, only one of Pennsylvania's 12 licensed marijuana wholesalers, Cresco Yeltrah, is shipping to retailers. Two additional growers aren't expected to have their crops harvested and processed into medicines until late March. Visco said TerraVida was overwhelmed by the number of patients. "I had projected 60 people initially for the entire month," Visco said. "We had over 600 patients in our first eight days." TerraVida will remain open with modified hours for patient consultations and pre-orders, Visco said. "Pennsylvania's market is much larger than anybody anticipated," Visco said. "No one could have projected it." In Bethlehem, Keystone Canna Remedies was down to a small number of cartridges filled with indica oil and some concentrates. Owner Victor Guadagnino said the shop was limiting sales to two cartridges per customer and would remain open to provide patient consultations. "We're going through some growing pains," Guadagnino said. "But as other providers come on line, I don't think we'll see this issue again." April Hutcheson, a Department of Health spokeswoman, said two more dispensaries were slated to open in the next week in Southeastern Pennsylvania: Ilera Healthcare in Plymouth Meeting and Cure Pennsylvania in Phoenixville. Ilera could not be reached for comment. A spokesman for Cure said the Phoenixville dispensary was on schedule to open April 13. "We encourage patients to call the dispensaries to find out if they have what they need and to set up a consultation," Hutcheson said. When the first phase of Pennsylvania's medical marijuana program is running at capacity, a dozen grower-processors will service a total of 51 dispensaries.